Demonstrators raise Libyan flags at a national unity demonstration in Tripoli's Martyrs' Square in 2012. 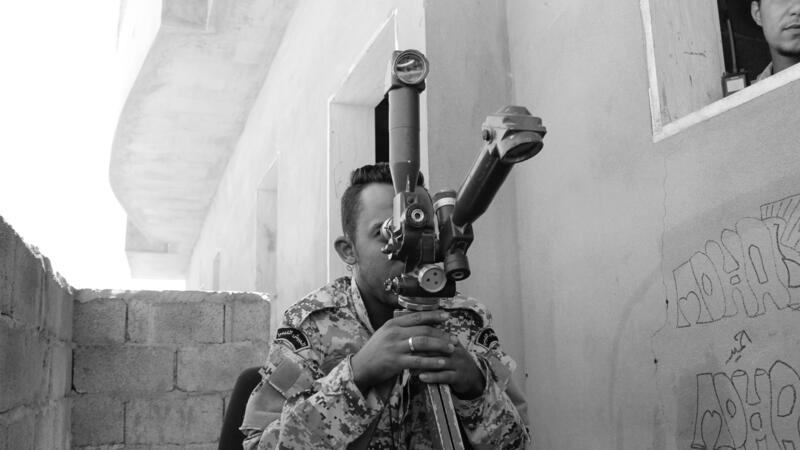 A Libyan soldier peers across the frontline in Sirte during battle against the Islamic State in 2016. "You had the blossoming of civil society; people were free to speak their own minds, they were able to organize themselves politically," says Wehrey, a senior fellow at the Carnegie Endowment for International Peace. "And so it was quite easy to get swept up in that triumphal moment." He witnessed the moment firsthand — and then watched as it fell apart. 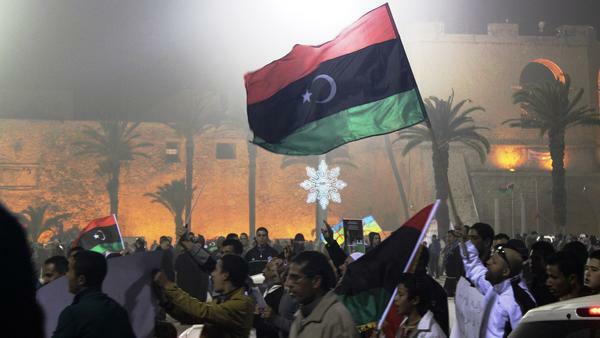 Tribes and militias turned on each other, and Libya descended into civil war. Wehrey documents the country's unraveling in The Burning Shores: Inside the Battle for the New Libya. They had the plans, but the problem was the will to execute them. So this was an administration — the Obama administration — [that] undertook this intervention with the explicit goal of not being responsible for what followed it, of really abdicating responsibility for the post-conflict recovery and reconstruction to the Libyans themselves, but also to the United Nations and the Europeans. And for various reasons, those actors proved incapable or unwilling to handle the reconstruction. The U.N. had its own set of problems: bureaucratic, structural. The Libyans were divided about how much assistance they wanted — they did not want to repeat an Iraq-style occupation, but at the same time, they did want some assistance. So it was this real quandary about, how do you assist a country that really had no experience in governance? The great tragedy of this was that Ambassador Stevens was so committed to outreach to the Libyan people and to a particular practice of diplomacy that really meant getting out on the street and meeting people from all walks of life. And the great tragedy of that attack was that it constrained that approach, it curtailed it. There was a tremendous retreat, or retrenchment, of America's diplomatic presence. There was no government in Benghazi to protect them, there was no army or police — they were at the whim of these militias. Many Libyans actually did try to help the Americans that night, and that story I do not think has been told fully, and I try to tell it in my book — that Libyans actually did try to come to the rescue of Chris. There were certain militias that helped the Americans evacuate. You had ... this sort of splintering of the country into two camps, into open civil war, in the summer of 2014. That was exacerbated by regional states that were playing a very cynical game of arming and funding the different factions — Egypt, the UAE (United Arab Emirates), Qatar and Turkey. And then in the middle of this vacuum that was opened up, you had ISIS come. And it was an obvious breeding ground for ISIS: a fractured state that already had a tradition of radicalism, of jihadism. You had Libyans that went to Syria to fight that were coming back — and they were really the carriers of the "ISIS virus," so to speak. And so quickly ISIS spread across the country. There are encouraging signs of normalcy in Tripoli: markets are open, there are sports clubs, you know, universities are open. But there is deep trauma. I mean, there's huge problems with medical care. You have Libyans actually joining those migrant flows across the Mediterranean, they're so desperate to leave. A lot of Libyans have left. You have rampant lawlessness. So on the surface when you go there, it seems OK, but there is a lot of kidnapping, there's a lot of criminality, and there are militia fights that can break out at any time in the capital over turf for various reasons. So things can go bad very, very quickly. So the calm you encounter on first sight is often very deceptive. Noah Caldwell and Emily Kopp produced and edited this story for broadcast. Sydnee Monday adapted it for the Web. Eight years is a long time - long enough for an American president to serve out two full terms and accumulate a long list of policy triumphs and mistakes. So it's notable what Barack Obama singled out as the worst mistake of his presidency - Libya. He says his worst mistake was his administration's lack of planning for the aftermath of the 2011 military intervention there. At first, when Libya's dictator, Moammar Gadhafi, was toppled, the country was seized by euphoria. FREDERIC WEHREY: You had the blossoming of civil society. People were free to speak their own minds. They were able to organize themselves politically. And so it was quite easy to get swept up in that triumphal moment. KELLY: That's Frederic Wehrey. He witnessed that triumphal moment firsthand, and then watched as it fell apart. Tribes and militias turned on each other. Libya descended into civil war, where he documents all this in a new book "The Burning Shores: Inside The Battle For The New Libya." He says the U.S. actually did draw up detailed plans to help Libya. WEHREY: They had the plans, but the problem was the will to execute them. So this was an administration - the Obama administration undertook this intervention with the explicit goal of not being responsible for what followed it, of really abdicating responsibility for the post-conflict recovery and reconstruction to the Libyans themselves but also to the United Nations and the Europeans. And for various reasons, those actors proved incapable or unwilling to handle the reconstruction. The U.N. had its own set of problems - bureaucratic, structural. The Libyans were divided about how much assistance they wanted. They did not want to repeat an Iraq-style occupation. But at the same time, they did want some assistance. So it was this real quandary about, how do you assist a country that really had no experience in governance? KELLY: Yeah. I mean, I gather it's hard to overstate just how little experience and infrastructure there was after 40-something years of authoritarian rule. WEHREY: Absolutely. It wasn't just authoritarian. I mean, Gadhafi ran it as his personal fiefdom. He centralized power. He personified power. So the basic muscle tissue of governance - I mean, ministries, staffs, bureaucracies - just didn't work. So you found a lot of NGOs and outside diplomats that were trying to help the Libyans were so frustrated because they couldn't get traction with the Libyans on the other side. They didn't have a partner to work with. Libya couldn't absorb or utilize the assistance that was being given. KELLY: ...The U.S. ambassador to Libya who was killed in Benghazi in 2012. You knew Chris Stevens. WEHREY: ...We crossed paths at the embassy. KELLY: As you sifted through and tried to investigate those much-investigated events, what strikes you? What leapt out? WEHREY: Well, the great tragedy of this was that Ambassador Stevens was so committed to outreach to the Libyan people and to a particular practice of diplomacy that really meant getting out on the street and meeting people from all walks of life. And the great tragedy of that attack was that it constrained that approach. It curtailed it. There was a tremendous retreat or retrenchment of America's diplomatic presence. And part of that was understandable for the need to safeguard lives. But part of it, unfortunately, was the partisanship - that this became so politicized back in Washington, D.C., that it affected America's ability to engage on the ground in Libya. And that's what I really took away from talking to Libyans, who said, look; what happened to you after this attack? And this is a real tragedy 'cause Chris would've wanted, you know, more engagement. KELLY: What about the events of the actual night where he died in Benghazi? Was there anything as you tried to piece that together that strikes you? WEHREY: The problem or what I found is that there were just really no good solutions or answers that night for who would protect the Americans. They were operating in a very fluid environment where there was no government in Benghazi to protect them. There was no army or police. They were at the whim of these militias. Many Libyans actually did try to help the Americans that night. And that story, I think, has not been told fully. And I try to tell it in my book - that Libyans actually did try to come to the rescue of Chris. There were certain militias that helped the Americans evacuate. And I think that that story needs to be told. KELLY: After that, violence in Libya if anything got worse. You describe that by 2014, the country was in all-out civil war. And then when it just seemed as though things couldn't get worse after that, ISIS rolls in. And so you have this what had already been an immensely complicated civil war getting even more complicated. WEHREY: Absolutely. You had, as you mentioned, this sort of splintering of the country into two camps into open civil war in the summer of 2014. That was exacerbated by regional states that were playing a very cynical game of arming and funding the different factions - Egypt, the UAE - United Arab Emirates - Qatar and Turkey. And then in the middle of this vacuum that was opened up, you had ISIS come. And it was an obvious breeding ground for ISIS - a fractured state that already had a tradition of radicalism, of jihadism. You had Libyans that went to Syria to fight that were coming back. And they were really the carriers of the ISIS virus, so to speak. And so quickly, ISIS spread across the country. KELLY: Circle back to the U.S. role in all of this. Obama - President Obama saying this was the single biggest mistake of his presidency, which is quite something. KELLY: What is U.S. policy now in Libya? KELLY: There's no U.S. ambassador in Tripoli. WEHREY: There's no U.S. ambassador right now. I would say today it's primarily through the lens of counterterrorism. KELLY: The fight against ISIS. WEHREY: Exactly. And also more recently al-Qaida, as we've seen from some strikes in the south. The Americans are still supporting the U.N. process. There's a very strong U.N. envoy that's making some ground in terms of brokering talks. And I think the United States needs to support that even more. KELLY: Well, walk me forward to where we sit now in 2018. I've never been to Libya. If I flew into Tripoli today, what would I see? What does it look like? WEHREY: You would see an airport that is functional but certainly not like an airport that you're used to in the United States or a Western country. KELLY: Does it feel like a country at war? WEHREY: It does not. There are encouraging signs of normalcy in Tripoli. KELLY: So markets are open. KELLY: Cars are in the streets. People are in parks. KELLY: Frederic Wehrey, thanks very much. WEHREY: My pleasure. Thank you for having me. KELLY: Frederic Wehrey - he is senior fellow at the Carnegie Endowment for International Peace. His new book is "The Burning Shores: Inside The Battle For The New Libya." (SOUNDBITE OF BRUCE COCKBURN'S "THE END OF ALL RIVERS") Transcript provided by NPR, Copyright NPR.